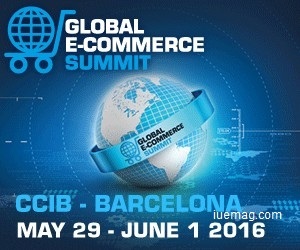 The Global E-commerce Summit (GES 2016) - a leading platform of e-commerce focused on information sharing, learning, and networking - takes place in Barcelona, Spain May 29 – June 1 this year under the theme “Shaping the future of digital commerce”. 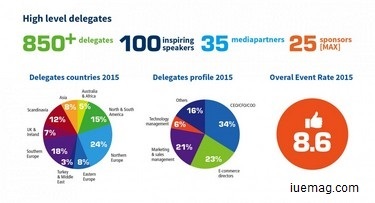 GES 2016 expands coverage to both on-line and in-store digitalization. The expanded focus means taking the conversation beyond closed discussions of on-line enablement or brick-and-mortar store survival to more comprehensively meeting (sometimes even anticipating) the needs of varying consumer profiles in a dynamic global market-place. In three themed sessions on digital in stores, start-ups, and e-groceries, global industry leaders will analyze and debate some of the most pressing issues facing retailers, entrepreneurs, and digital strategy professionals today. On-line shopping continues to grow exponentially, but retailers can ill-afford to ignore the value of physical store locations. Remember, on-line shopping still “only” accounts for about €1 trillion - less than 20% of the global retail market. Digital technologies that enable on-line shopping now touches all channels of customer contact. It has the potential to improve and create more efficient, enjoyable shopping experiences, whether from virtual on-line or face-to-face physical store fronts. To aide retailers, entrepreneurs, and digital strategy professionals in their move forward, GES 2016 expands its focus to examine current and emerging digital tools used to optimize efficiencies, open new markets, increase service and personalization, and enable the creation of truly sustainable and profitable shopping experiences at both on-line and physical store fronts. It is a truly exciting time for retailers as they seek to capitalize on the massive changes in consumer behavior driven by digital technology and mobile devices. Today retailers can use digital technology in various ways: for experiential purposes, to appeal to mobile users, increase convenience for shoppers, or to promote a retailer's online presence. This year, GES 2016 provides a snapshot of the retail sector in the digital age, and offers a glimpse of the future with real world experiences of forward-thinking brands like Holition, Lego, and OVS who are already capitalizing on the technology available. • The importance of having a focus on delivering outstanding customer experiences. • What will be important for retailers in their digital marketing over the next few years. • Understand how retailers are using technology to shape the customer experience and deliver ecommerce solutions. The internet has opened up the global marketplace for start-ups and small businesses. The trend towards online purchasing makes this the prime time for entrepreneurs to start new business ventures online. If you’re looking to start a start-up but are not sure where to start GES 2016 have pooled together CEOs from successful e-commerce start-ups like Made.com, Origami, Vigga, and Zoomaal, to share their experiences of setting up and growing their businesses. • Opportunities in emerging and latent retail markets. • What are the crucial elements for growing your digital start-up. • How entrepreneurs, armed with little more than an idea and a prototype, raise the funds to execute the business. Grocery is one of the largest segments in global retail. Valued at €3 trillion, it is three times bigger than the global apparel industry. Recently, grocery retail has gone through a number of changes, but the adoption of the digital channel has been by far the most impactful. With new online grocery (e-grocery) ventures popping up around the globe and traditional retail chains making huge investments into developing their online presences, e-commerce is expected to play an increasingly important role in grocery retail. This year, speakers from Farmy, Nestlé, NetComm Suisse Association, Predator Nutrition, and Vorwerk join GES 2016 to explore e-grocery growth and trends, as well as future market developments. • Strategies and challenges of selling food on-line. • Understanding of underserved needs driving this sector. • How online grocery shopping behavior is expected grow both in adoption and in share of wallet. Click here to register and join the GES community. And don’t forget to use the GESBAR16IUM for a significant Inspiration Unlimited eMagazine discount. Any facts, figures or references stated here are made by the author & don't reflect the endorsement of iU at all times unless otherwise drafted by official staff at iU. This article was first published here on 5th April 2016.